Phishing, spam, spoof, or hoax emails are a huge problem today. The best protection against these security risks is awareness and prevention. Warning Suspicious emails will say they are from Intuit and may ask you to take actions like logging in, providing personal information or downloading "tools." If you have received one of these emails, do not open it or access any of the links. Instead, please forward it immediately to spoof@intuit.com. We look into each reported instance. You can find the latest information from Intuit on how we protect your data and how you can protect yourself from email scams and other security risks. Go to the Online Security Centre page. Scroll down to the Security Alerts box which shows current and reported security alerts associated with scam emails. 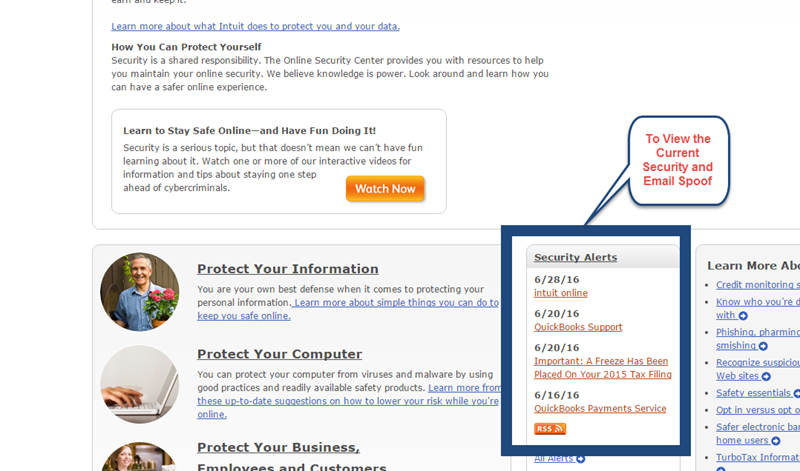 Find the associated Security Alert, then select it to see instructions listing any actions you'll need to take. Note: If you're unable to find an associated Security Alert, please contact Intuit Support for the product that is referred to in the suspicious email. Intuit Support can help you determine if the email is from Intuit or a possible phishing email that needs to be forwarded to our security team for assessment. What can I do to protect myself from a phishing attack? If you suspect you have received a phishing email from Intuit, please forward it immediately to spoof@intuit.com. We will look into each reported instance. Install antivirus software and make sure to keep it up to date. Make sure you use a modern browser, and keep it up to date. Keep your operating system and any critical programs up to date with the latest patches. These updates are frequently security-related. Do not respond to emails asking for details about your account, password, banking or credit card information. Do not open up any attachment that claims to be a software update. We will not send any software updates via email. It’s a good idea to never open any attachments unless you both know the sender and you’re expecting an attachment from them. Make sure you have strong passwords on your computer and your payroll files. Never share your passwords with anyone. We'll never send you an email with a "software update" or "software download" attachment. We'll never send you an email asking you to send us sign-in or password information. We'll never ask you for your banking information or credit card information in an email. We'll never ask you for confidential information about your employees in an email. We'll provide you with instructions on how to stay current with your Intuit product. We'll provide you with information on how to securely download an update from your computer. If we need you to update your account information, we'll request that you do so by signing in to your account or contacting Intuit. In today's world, security is a team effort. When our users notify us about suspicious emails they receive, it helps us keep everyone protected. When we work together, as a team, we make our environment a safe, secure place to do business.